A seven-day road trip, in a 1997 Toyota Caldina with a Scot, a Dane, and an American was just about to begin. It was the Sunday after the All Blacks game (that we won! 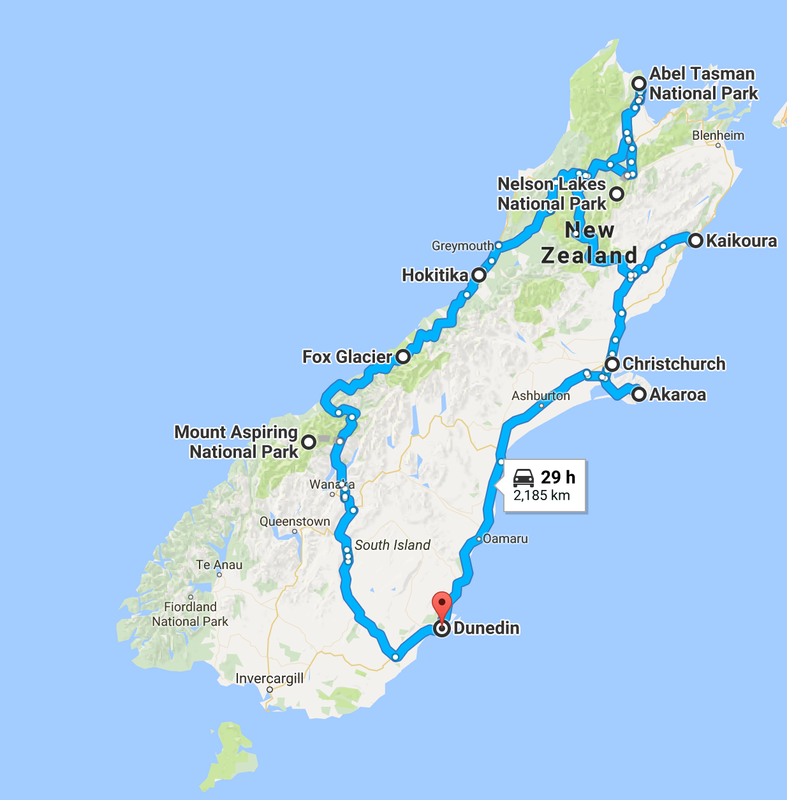 ), we packed up some food, filled up the tank, and were on our way to road trip the South Island. We got to Akaroa at dark and there were motor homes clearly in storage for the winter at the campsite we stayed at. It was a little eerie considering there seemed to be homes there, but no people. The bathroom facilities were quite nice and we pitched our tent right next to Pigeon’s Bay. We made dinner on our portable gas stove even though it took hours (note to self: do not try and cook potatoes over a gas stove in the wind – it WILL take hours). We cuddled up the three of us in our 2-person tent and drifted off to sleep. The next morning we walked around Akaroa seeing the waterfall and finding there was not much for us to do in the winter months, so we began our venture up to Christchurch. We arrived in daylight to a sketchy hostel (there were many different characters there, but hey it was cheap). We got upgraded to the “motel” rather than the hostel in order for the three of us to stay in the same room. If that was the upgrade, I’m not sure I want to know what the hostel aspect of the facilities looked like. Upon arrival, we walked around the city and discovered some of the aftermath of the earthquake. It was quite devastating, but reassuring to see all of the measures that are being taken to restore the city to what it once was. We explored what Christchurch had to offer from it’s a beautiful memorial, mesmerizing botanical gardens, educating museum, and delicious food (The Little High Eatery). We again went to bed quite early as we would be waking up for a nice shower and booking it up to Kaikoura for our kayaking reservation. We began our drive to Kaikoura from Christchurch to find that the road we were supposed to take up to Kaikoura was being repaired following earthquake damages. This would divert us an extra half an hour. We attempted to call the people who we had booked the kayaking back and luckily we had some kind souls who were willing to push back their kayaking adventure until we got there. We went kayaking and got really close to some seals and were able to view the beautiful mountains while we kayaked in the ocean (you truly can have the best of both worlds). After our kayaking adventure, we headed off to Nelson Lakes where we would camp at Lake Rotoroa. We arrived in the darkness and were accompanied by one other tent and a trailer home. Soon after, we set up our tent and were home to bed soon after. We woke up and then went for a walk around the lake. At that moment, we decided that we should probably turn around and start our way up to Abel Tasman, so that is just what we did. We got to Abel Tasman before dark and set up our tent, so we wouldn’t have to do it later. After our walk on the beach, we decided to go back and make dinner early in order to get to bed early, for we were waking up at 6.30am for a hike in Abel Tasman. Throughout the entire process of our cooking, there were birds known as Weka who were far too comfortable coming close. We played a couple of rounds of cards and were off to bed. Next morning, we were awoken by rain soaking our tent as we discussed our eight-hour journey that was about to unfold. We packed up our two packs and hiked three and a half hours to the site that was supposed to take eight hours to get to (men are we fast hikers, or really poor planners). Sadly, we had miscalculated and continued on the loop back to where we had camped the first night in Abel Tasman, so we could get up at our leisure in the morning. We had carried two packs full of extra clothes, food, sleeping mats, sleeping bags, and a TENT. At least I can check off my first backpacking experience off my bucket list, not a proper one, but a practice one. The next day we were regenerated and started the trek to Hokitika. We stopped at Pancake Rocks and they were really cool, though I think they should consider calling them pancake stack rocks. We got a nice shower and a warm bed to sleep in the second to last night on the road! Once we arrived we settled in and headed off to see some glow worms. We walked into the cave and it felt as if we were in fairytale land. After that, we went to an Indian restaurant and it was absolutely delicious (I have a passion for garlic naan both in Dunedin and Hokitika). We finished up dinner and headed back to the hostel for our nice showers (much needed). Although we had intended to watch a movie or play a game, we all lay in bed drifting off soon after. The second to last day we headed to Fox Glacier. Once at the glacier we walked up to the viewing point before heading to Lake Matheson. We went to Lake Matheson and did the loop walk, but stopped along the way on a dock to admire the pure beauty that surrounded us. Then drove to a beach and walked around before deciding to stay and watch the sunset. We thought it’d be efficient to cook our dinner on the beach, little did we know we were going to be attacked by sand flies. So we packed up and finished our cooking in the carpark before continuing on to Mount Aspiring National Park, where we would sleep. The night was freezing but we got to admire the stars upon our arrival. We all continuously woke up in the middle of the night checking our watches, wishing it was morning already and that we could get out of the freezing cold and into the car. We heated up the car and defrosted the windows as we got ready for the day and packed up our sleeping gear. It finally started to hit me that our mid-semester break was almost over. We drove to the blue pools just down the road from our campsite before heading to Wanaka. There we went to Mount Iron for a short morning hike, as did most of the locals on a beautiful Sunday morning. We then began the journey back to Dunedin, our home! While this experience was thrilling, relaxing, and overall a learning one it made me appreciate the present. Additionally, it gave me a stronger passion for all the beauty that lies within New Zealand; from the ocean to the mountains, to a community rebuilding an earthquake-affected area I can’t wait for the next new adventure in an old car. Bring good friends and good company who will put up with you when you’re smelly, tired, and will listen to your awful singing the whole way.